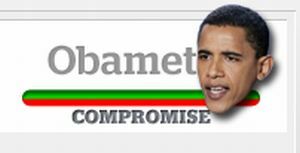 By Louis Jacobson on Tuesday, June 12th, 2012 at 5:36 p.m.
Twenty-two percent of Obama's promises are rated Compromise. With the campaign heating up and much of the attention on President Barack Obama’s promises from the 2008 campaign, we are posting updates and rating them on our Obameter. Here are some of the promises we’ve checked recently -- two promises Kept, two Compromise and one Promise Broken. • Obama said he would "work to ban the permanent replacement of striking workers." We found no evidence that the Obama administration had worked to implement such a ban. So we rated it a Promise Broken. • Obama promised to "review decisions by the Bush Administration that have denied (collective bargaining) rights to federal employees and seek to restore them." Obama signed a bill that granted limited collective bargaining rights to workers at the Transportation Security Administration, covering shift bids, transfers and awards. Pay, pensions and any form of compensation were excluded. However, we found no evidence that workers at the Bureau of Alcohol, Tobacco, Firearms, and Explosives received union representation again. So we rated this a Compromise. • Obama promised to boost funding for "the National Organic Certification Cost-Share Program to help farmers afford the costs of compliance with national organic certification standards." He also promised to reform federal crop insurance rates "so that they do not penalize organic farmers." Obama kept the first part of the promise. The U.S. Department of Agriculture operates two organic certification cost-share programs through its National Organic Program, and in a 2012 report to Congress USDA said it reimbursed organic farmers and handlers by more than $6 million through these programs in Fiscal Year 2011, up 20 percent over the previous year. But he has not yet completed the second part, on crop insurance. On balance, we rated this a Compromise. • Obama promised to "create an international tax haven watch list of countries that do not share information returns with the United States." Obama hasn’t done this precisely, but a new law now being implemented -- the Foreign Account Tax Compliance Act -- does even more. The law offers a whole new layer of scrutiny for both Americans who have overseas accounts and foreign financial institutions that have Americans among their account-holders. Its long reach has been controversial among banks, but we rated it a Promise Kept. • Obama promised to "vigorously pursue" hate crimes and civil rights cases. Obama signed the Matthew Shepard and James Byrd Jr. Hate Crimes Prevention Act of 2009, which broadens federal jurisdiction in prosecuting hate crimes. It also expands the definition of a hate crime to include bias-motivated crimes based on a victim’s actual or perceived sexual orientation, gender, gender identity or disability. In addition, the Justice Department’s Civil Rights Division pursued record numbers of criminal civil rights cases in both 2009 and 2010, established a dedicated Fair Lending Unit to stop discriminatory lending practices against minorities, and has pursued cases to ensure that citizens with disabilities and overseas military personnel have the opportunity to vote. We rated it a Promise Kept. Finally, we also checked progress on one of the GOP congressional majority’s pledges. • The new Republican majority promised to keep terrorist combatants in Guantanamo Bay, not in local jails or courtrooms. Obama had already earned a Promise Broken for his pledge to close the prison, so we’ve given congressional Republicans a Promise Kept for keeping the facility open and running.